I love finding out what peoples favorite Thanksgiving foods are. Do they love the turkey the most? The mashed potatoes and gravy? Crandberry sauce? For me, it’s a no brainer…the PIES!! 🙂 But if we’re talking non-dessert items, this Sweet Potato Souffle is my number one favorite! Stuffing comes in close second. We have a huge extended family that gets together every year for Thanksgiving. My mom has made this Sweet Potato Souffle every year since I can remember and it’s one of our family’s most beloved recipes! 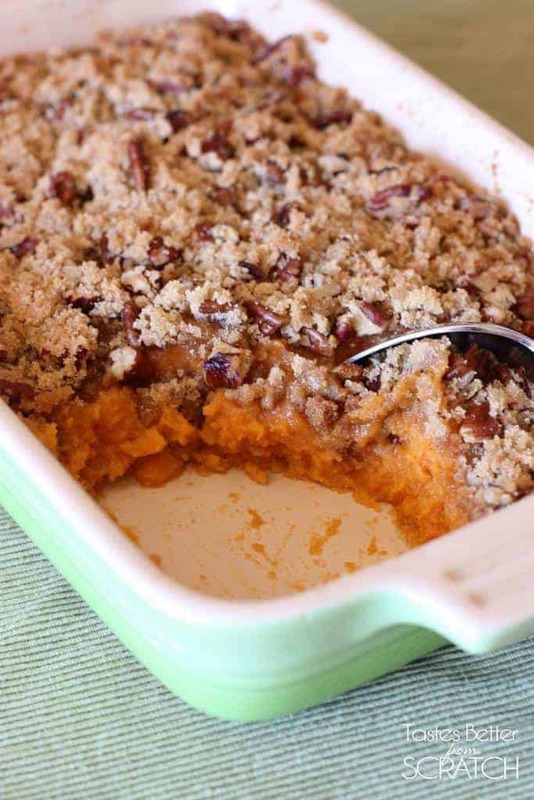 Most sweet potato casseroles I’ve tried are overly fatty and sweet. They contain so much added sugar and butter! This recipe has half the sugar and butter that most do, but it’s still sweet and completely delicious. Comfort food at its finest! I’ve updated this post with better instructions and step-by-step photos. 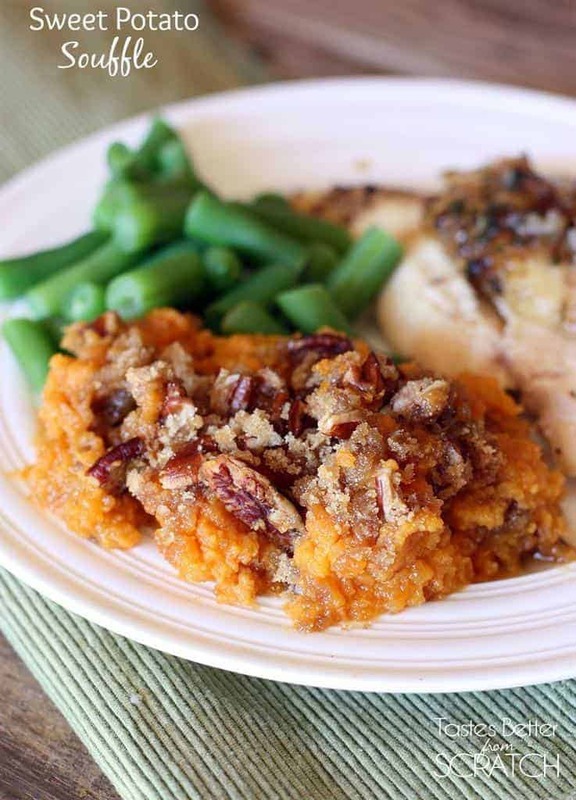 Find the new recipe HERE or search “sweet potato casserole” in the search box. Can this be prepared the day before and then baked on Thankfiving day? Hi Denise, It can definitely be prepared ahead of time! Cover and refrigerate the yams the night before. 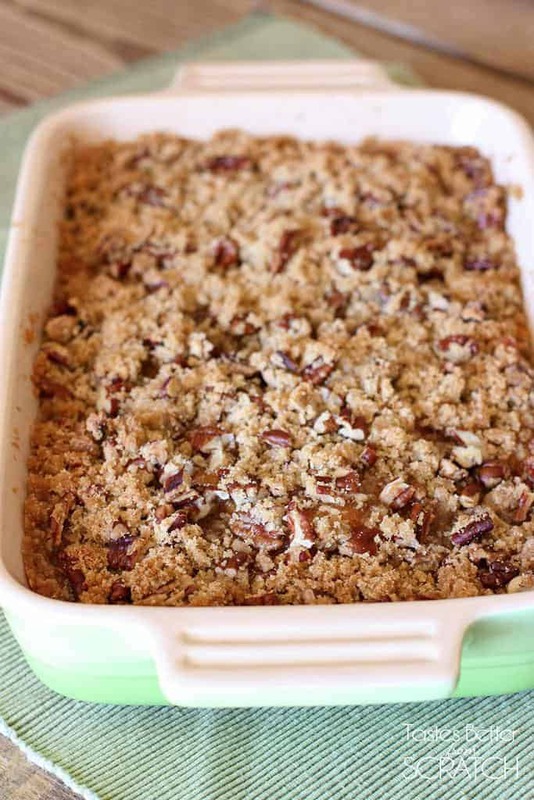 Then I would suggest putting the pecan topping in a ziplock baggie or separate container and then add the topping right before you stick it in the oven. my son is allergic to nuts, so I’m thinking about using oatmeal in place of them. What do you think? I love the recipe otherwise! Hi Jen, I’m sure that would work well–my son is also allergic to nuts so I just put aside a bit of the filling for him and bake it separately. I made this for thanksgiving and received so many compliments! I modified the topping (halved the sugar, added oats) because I knew some family members don’t like food too sweet, but was really surprised how delicious the soufflé turned out. Thanks for the recipe Lauren! Thanks Holly I’m so glad you liked it! You adaptations sound great–I like the idea of adding extra oats! Hi There! How many people would you say this serves? Hi Kari, it will make about 8-10 decent sized side dish portions. Hi Kait, it makes about 8-10 decent size side portions. Good look, I hope everyone loves it as much as we do! This is always a Thanksgiving favorite!